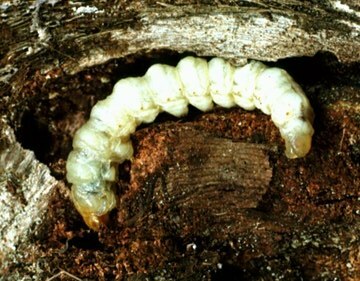 Region: This root borer can be found throughout North America. Life cycle: This insect produces one generation each year and can take up to two years to complete one life cycle. The pupae overwinters in the soil. Physical Description: This round, white caterpillar grows to about 1 3/4 inches in length. 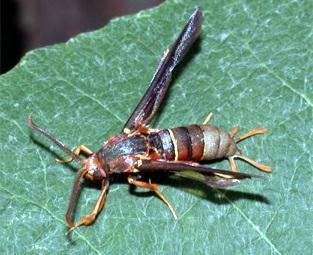 The adult is a brown and orange, clear-winged moth. The eggs are laid on foliage. Feeding characteristics: The larvae feed within the roots of the grape plant, and will remain there for two years. Controls: Cultivation of the soil is the most efficient control. Cut off the injured stems and burn them to destroy the Borers. In the fall, burn all old stalks to destroy the eggs.